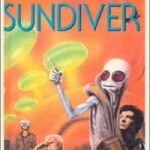 This is my second time reading Sundiver and again I enjoyed it immensely. Two of my running favorite concepts are here: applied schizophrenia and engineered evolution. The applied schizophrenia seems more of a plot saver placed to give the protagonist a device to win the final showdown. I was left wondering if it was really necessary for the book. Was this a concept that Mr. Brin had been mulling over while writing the book? Did he really feel that Protagonist needed it to win the day? Is this foreshadowing for the rest of the series? The engineered evolution, used on a galactic scale, gives our myriad alien encounters a social structure which I enjoyed in a Star Trek/Babylon 5 kind of way. 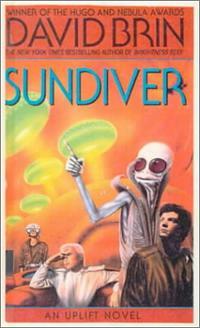 I have read several of Mr. Brin’s books and they have all struck me (so far) as flawed masterpieces. He lays down some really heady concepts while being able to flesh out characters that I enjoy. He tries hard to make his work accessible and this seems to translate as the need for a Final Confrontation. This climaxes usually disappoint me, maybe I find them unnecessary, maybe I just don’t agree with his methods of resolution. I’m not sure yet but whatever the perceived flaws they certainly don’t stop me from picking up another Brin book or devouring his thoughts on Quora. The most frustrating thing about this book? Both times I have read it with the full intention of continuing through the rest of the Uplift series. Both times I have gotten distracted and moved on to other things. In fact it I finished this book at the beginning of the summer and haven’t had time to collect my thoughts about it much less continuing the series. I’ll keep trying. This entry was posted in Bibliography on October 18, 2015 by ceyton.